We hitched a ride the next morning to the park entrance. It’s only about two kilometers from the town so it’s not too big of a deal. We got there around 9 am and walked through the siq which is a mile-long narrow gorge that leads you to the most notable site in Petra, the Treasury. I thought that the siq was actually way cooler than the Treasury. However, the Treasury is quite magnificent as well. Petra was awesome. It was about 37 (Celsius) when we arrived in the morning, but the morning got hot… fast. So we moved through Petra at a pretty good pace. 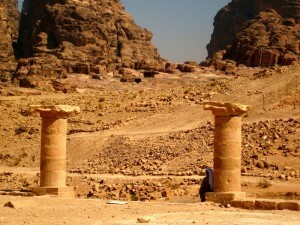 There is a lot to see, but if you just want to do all the major sites and a few walks, a full day at Petra is enough. Make sure to get your money’s worth too (26 JD= 26 Euros, for the day). 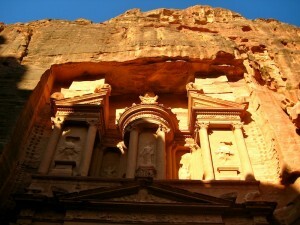 FYI about Petra, it was only found in 1812, so therefore it is actually quite a recent discovery. It is said to date back to 100 BC, which just fascinates me considering the engineering and architecture of this ancient-city. Truly, a wonder and a site to see. 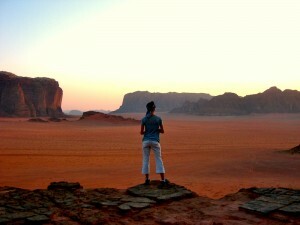 Around 2 pm we decided to head back to the hostel because we were trying to make it to Wadi Rum before the sunset. That night we were staying with a Bedouin in the desert of Wadi Rum. A Bedouin is a person who associates him or herself with a desert-dwelling ethnic group (mainly Arab). The people of the desert are said to protect the desert and and use many resources from the desert. We stayed with a nice Bedouin that night and he took us out into the desert, did some hikes, watched the sun set, then he cooked us a wonderful dinner over our campfire. I slept under the stars that night in the middle of the desert, in peace… with only the sound of the wind. It was really magical. It was so freeing and so comfortable. We woke up early the next morning and our Bedouin took us to Aqaba, where we would be taking the ferry to Egypt around 1pm. Hopefully everything goes well… because after last night I think I have half the desert in my hair and I could use a shower.